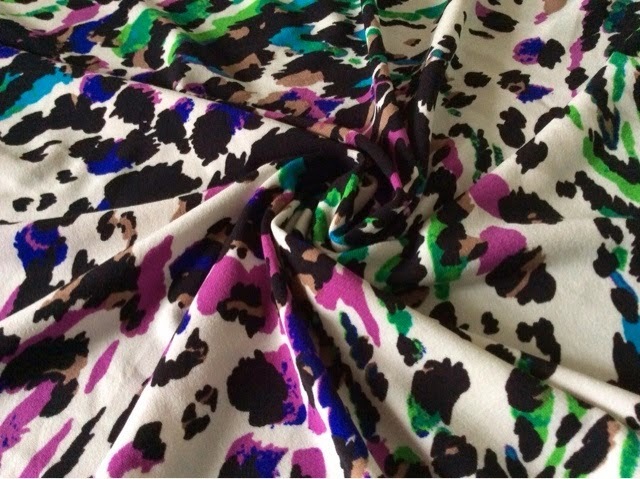 Fabric Mart Fabricistas: Reader's Pick Sew-Along: Fabric Selected! I have to be honest, I don't have a lot of white-dominate clothes in my closet. But there are enough jewel-tones in this fabric that make up for it. I'm really excited to see what the dress will look like when it is finished. If you're coming in late, we are running a sew-along where the reader's pick the pattern and the fabric that I use to make the garment! We will be sewing New Look 6097, a dress that was voted one of the Best of 2013 on Pattern Review! Interaction with the reader is most important to us in this sew-along. We're giving you two options to share photos of the fabrics you chose, progress photos and finished garment photos. We set up a Flickr group so you can share all of these photos. Don't have Flickr? That's ok. Comment below, including a link to your blog or other photo-sharing space. Join our Flickr Group now! Copy and paste into your blog, or use the HTML code to the right side. Everyone that participates and finishes New Look 6097 will be entered in a random drawing for a $50 gift certificate to Fabric Mart! How exciting is that? I am so excited to start this! Of course... I had seen the pattern several times but never got around to buying it. After this sew-along was announced, I hurried over to Hancock's and JoAnn's - only to find that they were out. Bleh. I ended up getting it on eBay, so I am ready! LOL! And the drawing... well, a chance for $50 at Fabric Mart sounds just lovely! Glad you will be joining in the fun! Don't have a flickr account, so I will give you all my blog link. Thanks for sharing your blog! I look forward to seeing you in the sew-along! Yeah, I voted for that fabric! Love it and can't wait to see your dress completed. I need to rummage in the (oversized!) knit stash bin this weekend and select a fabric for the sewalong --- I'm certain to have many options for a muslin as well as for the actual garment. I've had the pattern for a long time and am really excited about making this dress --- the sewalong is just the nudge I need :D.
I've got the pattern and fabric in-hand and ready to go. My beautiful knit came today from Fabric Mart (I ordered when it was on a super special deal last week). It's gorgeous. Can't wait to to get started. Grandma, I bought that exact same fabric, I love it! My fabric should arrive any day now. I'm pretty excited - this will be my first knit! I remember WAY back when I was a young teen or so, and my mom was making something and showing me about patterns. I specifically asked her about to fix the pattern if it didn't fit right. She said she never varied from the pattern as it was purchased. Well, since I am tall and quite long-waisted, they never fit and I lost interest in sewing. After all, why put the time and trouble into making something SURE to not fit? It took me many years and much reading to get brave enough to start altering patterns. Now I don't even give it a second thought, but the first time I thought I was doing some incredibly brave and breaking all the rules! LOL! Hi Angela, During the sew along you can ask about any fitting issue you are having. Of course I always recommend making a muslin if you know you will need to make alterations. It is up to you if you make your muslin during the sew along or if you do it now and sew with the nice fabric during the sew along. I will give everyone time at the end of the sew-along to catch up, so if you're worried about getting your submission in for the gift certificate, there will be time. Thanks!! We have one person that uploaded a photo of the fabric they are using. Share yours too! I wanted to participate because I've been eyeing the pattern for some time but of course all the local retailers I've been to don't have this pattern in stock (it's not even in the current catalogs in the stores?!) It doesn't appear to be discontinued according to the NL/Simplicity website. Oh, well. I will grab it up if they happen to have it when I go next if the sew-a-long is still going! Excited to see everyone's projects! !